to a brave day abominably bare. 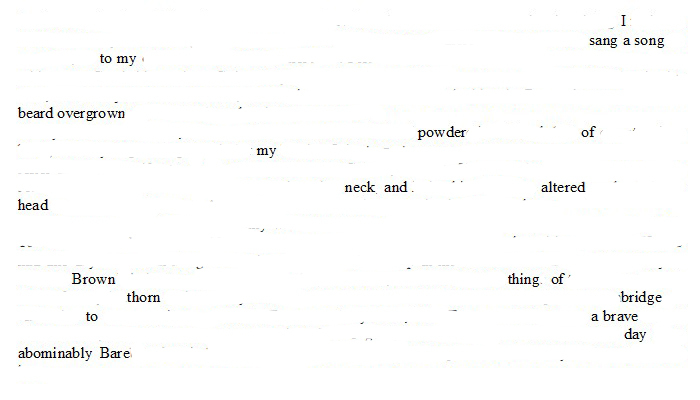 Erasure poem derived from The Diary of Samuel Pepys, Wednesday 22 February 1659/60. Whitman-esque. But did he ever erase anything? I doubt it. Lord knows some of his works might’ve benefited if he had. Oh, I like this one a lot. Yes, indeed! He mentions it in the entry for the day, but I’m not sure whether that will make it into tonight’s erasure or not. Possibly not too different. I am old and set in my ways, I’m afraid. But we’ll see. Next PostNext Zuihitsu for G.